What is the definition of an “ideal” client? The wish list could even include that ideal clients are “raving fans” of the practice who send referrals and write stellar online reviews. Veterinary practices tend to try to be all things to all people. This is not a marketing strategy but instead is driven by fear (eg, fear that focusing on a specific clientele will not produce practice success). However, good clients are good fits—for you. If you wish to focus on equine practice, find horse owners within your farm call radius and reach out. If your interest is small animal reproductive practice, target breeders and handlers. Every practice is unique. To find your ideal client, use the five P’s. People: Using your avatar, determine whom you want to walk in the door. Define their demographics, what they are looking for in a practice, and their needs. Product: Create a list of services you offer that will satisfy the needs of your ideal client (eg, doggy day care for single working clients, pickup limo service for clients who cannot drive to the practice). Placement: Where is your practice located? Is it easily accessible by your target client base? Promotion: Consider where your avatar can be reached. Will he or she be searching social media or reading a newspaper? Price: Create a pricing strategy that will satisfy your ideal client. Here are 2 examples of using the 5 P’s with a specific focus to find your perfect client. People: You determine that you want clients between 30 to 45 years of age, have 1.75 kids and 2.5 pets, are middle- to upper-income, have a college-level or higher education, and live overcommitted lives. The children are involved in multiple outside activities. The parents volunteer for the PTA and are purchasing a home. They listen to books on Audible as relaxation and keep active running with their children in strollers and with their pets. They are comfortable with social media and prefer to text rather than call. Their pets are important family members and go on family vacations. Product: You will offer high quality medical care, preventive products, home delivery of prescriptions, food, and toys through an online store, and pet-enrichment day care. You will send reminders and correspondence digitally. Clients will ask questions via text and you will reply using your texting app, which will also allow you to cut and paste the conversation into patient records. Progress examinations will be performed using a smartphone video and telemedicine platform. You will send clients’ pets digital birthday cards and post pictures, with their permission, on your social media pages. Placement: Your practice is located close to the children’s school and baseball and soccer fields. The practice is also near the clients’ neighborhood, where many homeowners are in your target age and income bracket. Promotion: You promote the practice on social media platforms using your avatar as your target demographic. Facebook lets you choose the specifics (eg, age group, whether they have children or own pets, income level, housing type). The practice team will also get involved in community schools and other nonanimal volunteer work where your avatar clients will be present. Pricing: You will calculate your prices based on 20-minute examinations (because most client education has been done digitally), your advanced technology, your attractive well-maintained building, and your multiple communication platforms. Your veterinary team is highly trained to offer an exemplary client experience with on-time appointments, low-stress patient handling, tailored client communication, and sincere empathy. The team also provides clients with multitiered education resources including brochures, online libraries, and video instruction. All of these should be considered when setting your prices. People: You want to serve elderly clients whose pets are important companions, but the clients are on fixed incomes and have difficulty paying high pet-care bills. Product: You will offer preventive care services and possibly a pick-up and delivery service. You will communicate with handouts in large font, send post card reminders, and make phone calls, to land lines if necessary, to schedule progress examinations. Placement: Your practice will be in an older, established neighborhood, or near a retirement facility. Promotion: You will mail promotional materials and client newsletters. You will volunteer your pet as a therapy pet and visit hospitals with your “good citizen.” You volunteer for Meals on Wheels. Pricing: You will calculate pricing based on your clean, but basic, practice facility and on 30-minute examinations because elderly people tend to need more time. You will also offer wellness plans that can be paid monthly to make care more affordable for fixed-income clients. You will offer home delivery of chronic medications and pet food through the online store to reduce trips to the practice. You also will sign up clients for these deliveries in their homes if they prefer not to deal with technology. Not every client who comes through the door will fit your target. Consider Nordstrom and Walmart, which are both successful business models that center on their customer demographic. Nordstrom is a high-end retailer with designer goods and extraordinary customer service. The stores are uncluttered and the merchandise elegantly displayed. Walmart, on the other hand, focuses on more affordable goods that are displayed in large quantities, high-volume sales, and limited one-on-one personal service. Environmental Systems Research Institute offers Tapestry Segmentation,3 a reporting tool that gives insights into America’s population. The data from its research break down America’s neighborhoods into 67 different demographic classifications and could be a useful tool for practices looking to refine their client avatar. Practices can be successful in almost all segments if they learn to focus on defining and targeting their ideal clients. Those who do not match the ideal client avatar are looking for a different experience than the one your practice offers. Unmet expectations, negative reviews, and stressful in-clinic interactions may result. Whom do you want to serve? From the designer bag-carrying dog owner, to the rural farm owner, to the low-cost spay/neuter client, your practice’s ideal client is unique. Whom you choose is your decision. 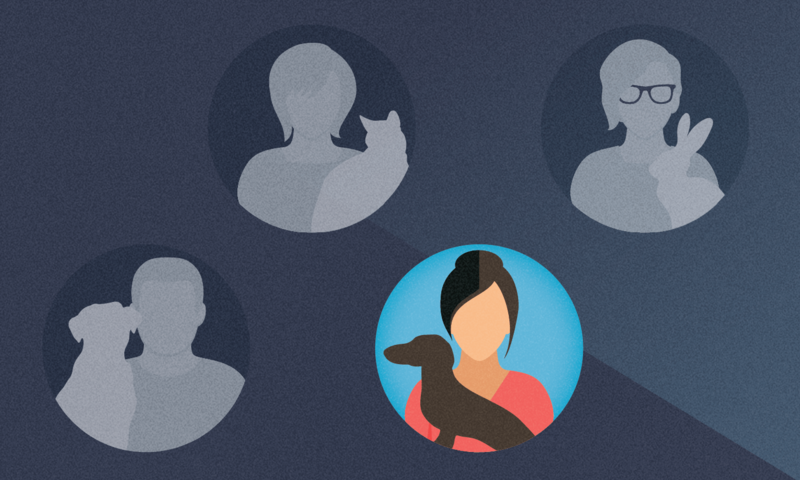 Every client has a pet needing an advocate and there is a niche for every client. 1 Research US demographics to be familiar with the choices available for the group your practice wishes to serve. 2 Use the 5 P’s (ie, people, product, placement, promotion, price) to target the kind of client who will be a perfect fit with your practice. 3 Accept that not every client who comes to your practice will be your ideal client. Godin S. Purple Cow: Transform Your Business by Being Remarkable. New York, NY: Penguin Group; 2009;50. Dubinin V. Target Market and Customer Avatar Worksheet. profitwithvitaliy.com. http://profitwithvitaliy.com/Target_Market_and_Customer_Avatar_Worksheet.pdf. Accessed August 27, 2018. Esri Demographics. Tapestry Segmentation. https://doc.arcgis.com/en/esri-demographics/data/tapestry-segmentation. Published 2018. Accessed July 2018.